Having unexpectedly had to replace the stormwater which now runs right down two sides of the extension and along the third side and having a sewer main running right close to one of the lines of piers our earlier thoughts of not wanting to dig pier holes, pour concrete, use treated pine or other materials that embed in concrete were coming to fruition. Concrete has a lot of embodied energy, treated pine even with modern methods is still, in my opinion, not very nice and the lengths of bearers involved meant using LVL bearers (Laminated Veneer Lumber) which you can get in any length you like but are expensive. 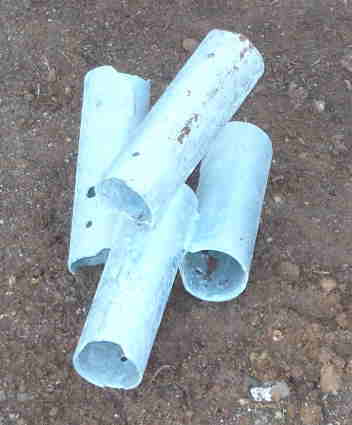 We did a lot of research on the internet and came up with a system called Mega Anchors These are deceptively simple looking tubes of galvanised steel welded together. There are three tubes at angles with an upright tube that takes the pier. They can also be installed very close to stormwater and sewer. In Tasmania there are no regulations about how far away to these the piers must be according to Acess Solutions. 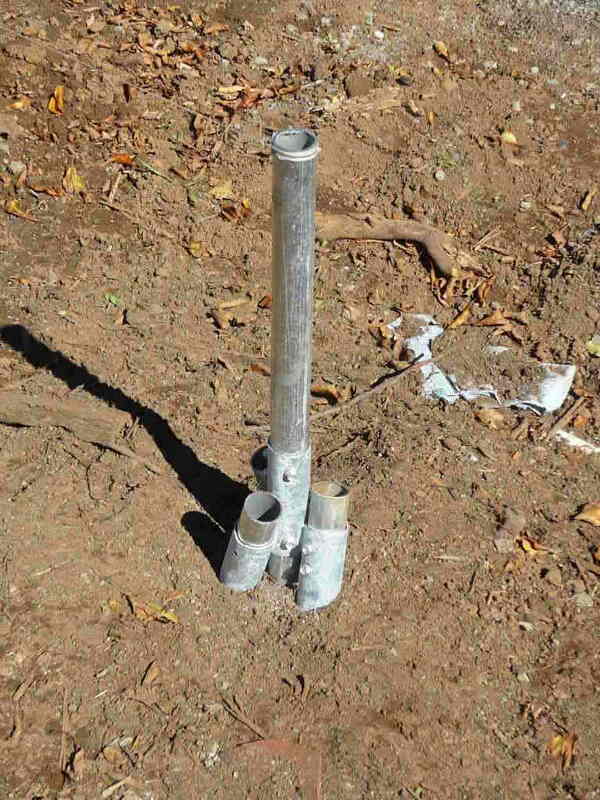 This saved the cost of moving sewer lines etc. You might want to check out regulations in your own State. Long steel tubes are hammered into the ground through the Mega Anchor. The length hat goes into the ground is determined by an engineers report in conjunction with a soil test which we had done much earlier. The company in Tasmania that sells and installs this system is called Access Solutions and is based in the South of the State but travels anywhere. 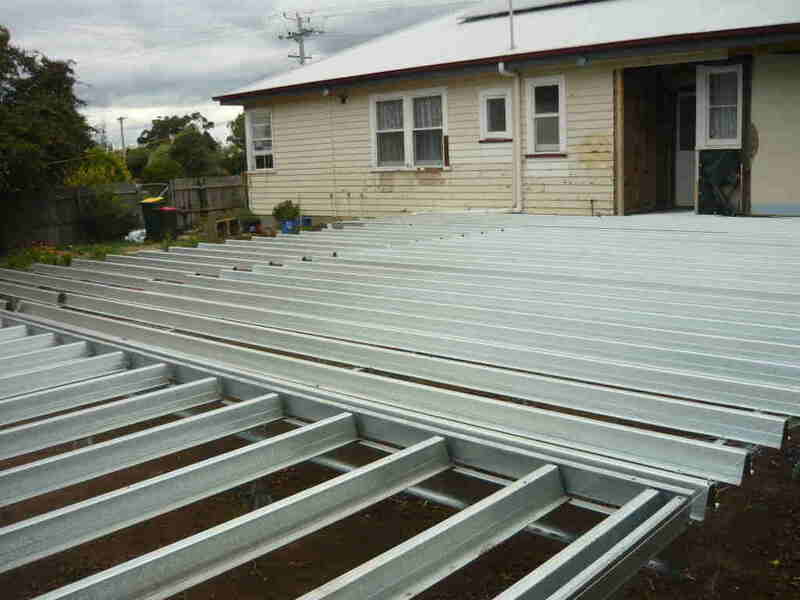 We obtained a quote for the Mega Anchors and Access Solutions asked if we were interested in steel bearers and joists. After more research on the environmental side of using steel versus wood which is a tricky one, we decided that steel is lighter than wood, fully recyclable, transport costs are less overall from what we could find out and the cost comapartive to us building a traditional bearer and joist deck BUT labour was included !!….. AND because their engineers worked out the lengths of tube needed etc and provided the all important form 55 for Council we did not need an inspection. All we did was provide Council with the computations, Form 55, and the certificate that Access Solutions provided to say that the job had been done in accordance with the calculations. 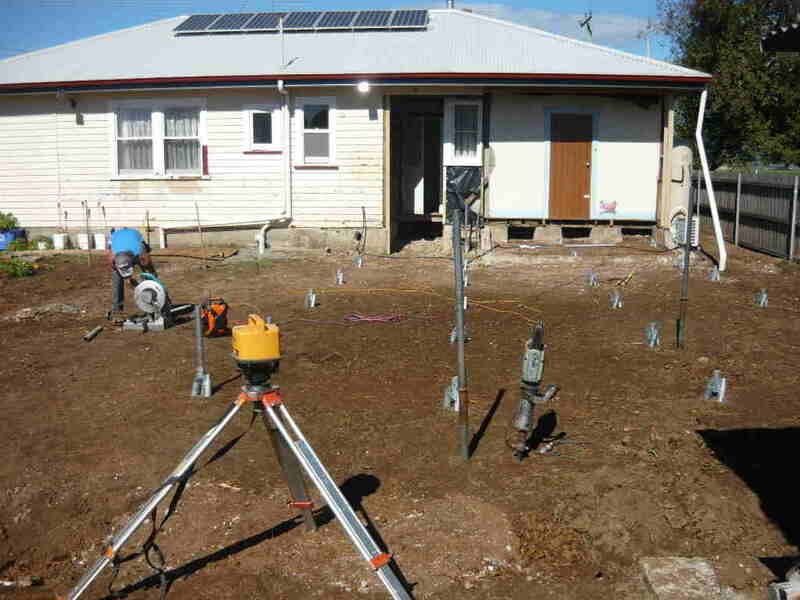 Three days before Easter Clinton arrived with a one ton Ute and large trailer that contained all the anchors, bearers and joists needed for the job. Easter Thursday he left for Easter and returned the following Tuesday for half a day. Three days in total. Very professional. Nothing was too much trouble. He ensured that the joists were put at a smaler centre than had been specified as we are using smaller flooring sheets than normal so this will save a lot of cutting for us. He also stretched chicken wire under the joists so that we can install underfloor insulation before we install the floor and it won’t fall out. We are very pleased with the installation and the company that installed it Acess Solutions. great to see you are using mega anchors, what is the life expectancy and warranty they give you for the maga anchors? Great solution to building the first half of your extension. 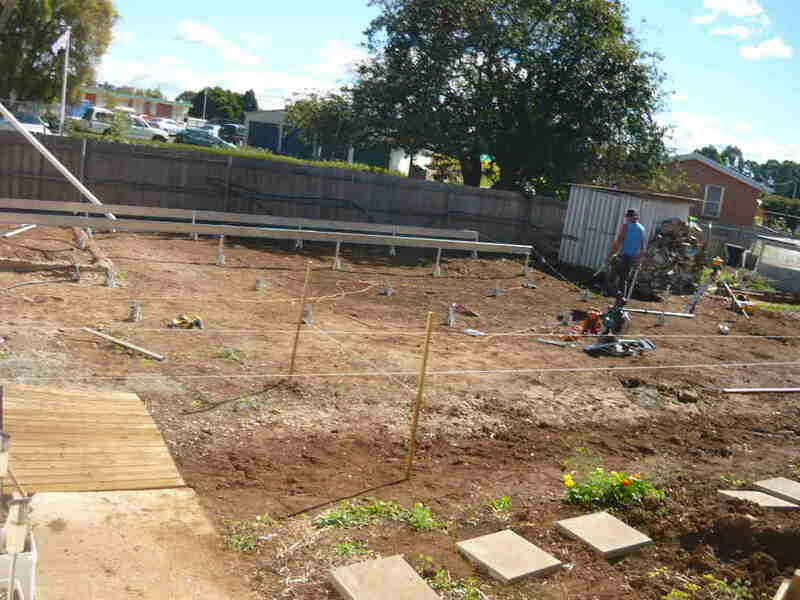 What was the cost for the anchors, bearers and joists installed. Have been following your writings with interest. 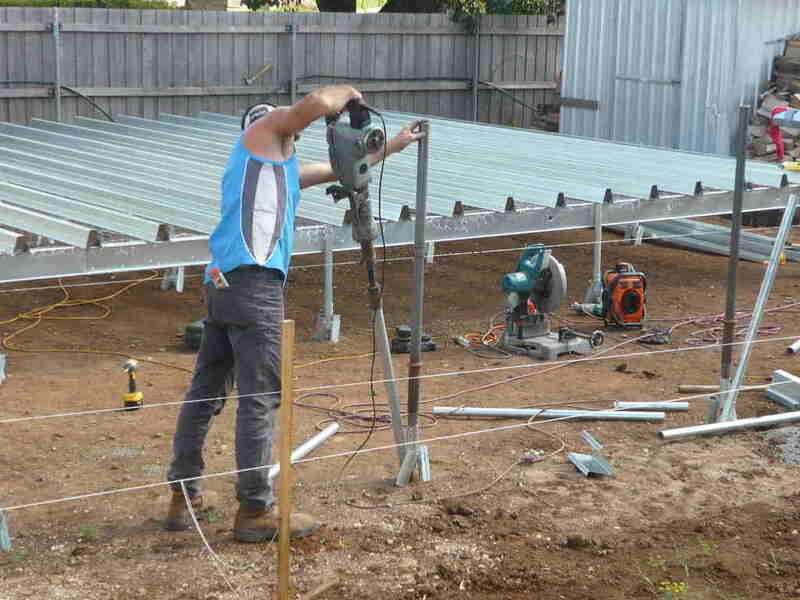 I am particularly pleased to read of your experience with Mega Anchors – we have decided to steer away from a slab floor for the strawbale we intend to build on our block in Collinsvale, and I had heard of these supports but have not known of anyone who had used them. Now we will have to consider the idea of using steel bearers as well! I will make further enquiries.